Known as a ‘Citog’ in my own native tongue, I’m sometimes called a ‘Leftie’, or when I was stateside, a ‘Southpaw’. All of these names basically have the same connotation; You’re different. Which, to a person like me, is the highest of compliments! Although it hasn’t always been that way. The root of our ‘otherness’ may lie in any one or all of the following sources. Organised religion; they seemed to consider the left as being evil and connected with the devil. Medieval society; they invented the whole shaking hands with your right hand in order to show that you were not carrying arms. Or a more recent theory basing the cause on the left hand’s use for hygiene purposes in the non-industrialised world. However, our very language demonstrates that ‘left’ has been associated with at best strangeness and at worst badness for centuries. The Latin word for left is Sinistre and we don’t need a dictionary to work out that that’s not good. In French, it is Gauche, meaning awkward or tactless (quelle horreur!) And apparently in old English, lyft meant weak. As a result of all this anti-left brainwashing, many left-handed children were forced to write with their right hands at school – for no better reason than an outdated superstition. Thankfully, I began school just as this practice was dying out, yet I still remember that fateful day when the teacher came to my desk and noticed that I was carefully shaping the letter ‘A’ on my copybook with my left hand. She hesitated; I knew what was coming and gave her what I hoped were these eyes. I’d been forewarned you see, by my predecessors. They were going to try to change me. ‘You’re a citog,’ she remarked. I said nothing. I could see that she was mulling it over… what to do. And then, with a simple gesture that would impact the rest of my writing years, she simply batted the idea away and said, ‘You’re alright.’ The irony! I’m all left lady, but what’s a dominant hand between friends. So everytime I sign my name, fill in a form or initial a receipt, people feel the need to comment on the fact that I write with my left. It’s like we are some kind of an enigma in an otherwise predictable world. What’s more, I hold my pen between my index finger and my middle finger, which does tend to draw some queer looks. ‘How can you write like that?’ they ask. ‘Probably with better control of the pen,’ I mumble. Our numbers are estimated at about 10% of the population and you can even buy left-handed products now like scissors (totes awky to use) and spiral notebooks. Although I’m not sure they’ve found a solution to the smudge-fest that is your hand trailing over the words you’ve just written. Using the right hemisphere, we ‘see’ things in this mode that may be imaginary – existing only in the mind’s eye. We understand metaphors, we dream, we create new combinations of ideas. Edwards points out how important it is for our school system to cultivate the right hand side of the brain, which has been left largely neglected by our curriculum. Thankfully, we now live in an age where difference can be celebrated rather than demonized and at the risk of developing a left-handed superiority complex, here is a list of some of the august company in which we, as lefties, find ourselves! Previous Post Happy Easter Book Sale! Next Post Things I’ve Learned About Writing… 15 of them! What a fascinating post, I really enjoyed reading it. I’m currently learning to do everything left-handed (due to disability) and have a new appreciation of how right-handed the world is. Thanks Evie from a fellow leftie. I love the fact I am different although it is not without its struggles. Ever taken over the stirring of a sauce on the hob from a right handed person and found yourself covered in splashes as you reverse the stirring? As for the chequebook problem – left handed chequebooks are fab! So true. And you’re right, as soon as my teacher saw I was a lefty, I was pretty much left to my own devices! 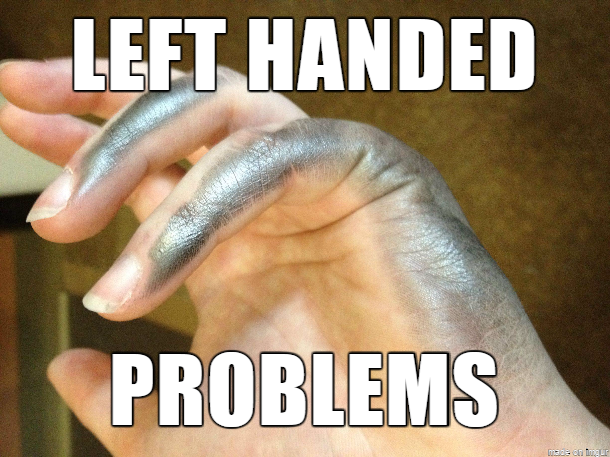 I too am a leftie. I spent years thinking I was unable to peel potatoes, then somebody gave me a left handed potato peeler 🙂 Great post! Haha! Those damn potato peelers!! I never had an issue with being left handed or thought as myself as different until I went to school. Especially in the first grade, when I had trouble using scissors and I began to slant my paper when I learned to write. Drove my teacher crazy. She even called in my parents to discuss switching me. My parents both right handed but having left handed mothers, told the teacher to leave me alone, which she did, but not in a good way. I like you was left to my own devises. Thankfully I was smart.